SEOUL -- Samsung Electronics Co. unveiled Friday the Galaxy Note 9 phablet, which is equipped with a new stylus and the best battery and storage among all of its premium devices. The new product could help breathe new life into the company's IT and mobile division. SEOUL -- Samsung Electronics Co. on Friday announced its first artificial-intelligence speaker, the Galaxy Home, in a surprise move during the showcase event of the new Galaxy Note 9 smartphone. WASHINGTON -- The United States and South Korea are working closely together on their joint response to North Korea, the State Department said Thursday following Seoul's announcement of high-level inter-Korean talks next week. The Seoul government said the two sides will meet at the border village of Panmunjom Monday to discuss the implementation of April's summit agreement and preparations for a follow-up meeting between South Korean President Moon Jae-in and North Korean leader Kim Jong-un. WASHINGTON -- The United States and North Korea continue to have conversations "virtually every day" in the wake of their leaders' nuclear summit in June, the State Department said Thursday. U.S. President Donald Trump and North Korean leader Kim Jong-un met in Singapore and agreed to work toward the "complete denuclearization" of the Korean Peninsula in exchange for security guarantees from the U.S. But skepticism has grown about the implementation of the deal. 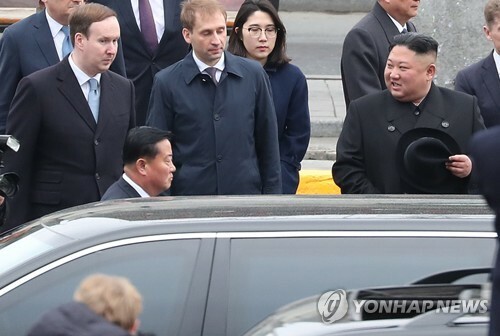 SEOUL -- North Korea has called off a planned joint field survey of cross-border roads for a modernization project, a unification ministry official said Friday. The North informed the South late Thursday that it wants to postpone the survey, scheduled to start from Friday, but didn't provide reasons, according to the official. SEOUL/ASAN, South Korea -- Venerable Dhammakitti, a Sri Lanka-born monk who recently received South Korean citizenship, said he is extra cautious when wearing his orange Buddhist garment and always seeks to fully cover himself, saying he does not wish to attract unnecessary attention. SEOUL -- Samsung Electronics Co. said Friday it will start preorders for the special edition of the 512 GB Galaxy Note 9 next week, with the official sales starting in the country on Aug. 24. SEOUL -- "Along With the Gods: The Last 49 Days" surpassed 8 million in attendance on the ninth day of its run, data showed Friday. The local fantasy film sold 325,141 tickets for a nine-day cumulative of 8,005,116 views on Thursday, according to the computerized tally from the Korean Film Council. SEOUL -- A former vice president of Samsung Group's now-disbanded decision-making body was grilled by prosecutors Friday over alleged involvement in a scheme to hamper labor union activities of employees at a Samsung Electronics Co. subsidiary. SEOUL -- A South Korean private enterprise said Friday it will push to publish North Korean novels in South Korea, as part of efforts to stimulate private sector inter-Korean exchanges. The Seoul-based enterprise, named the South-North Employers Federation of Farming Cooperative for Unification, said that it has reached an agreement with North Korea's Taesongsan Copyright Agency via a Chinese agent to obtain the copyrights to 11 North Korean literary works.